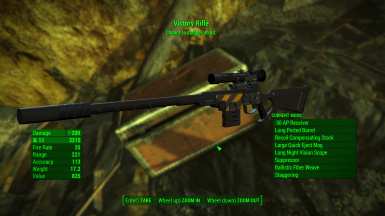 The iconic long range weapon of the Fallout Series makes its return as a fully moddable gun in the Commonwealth! 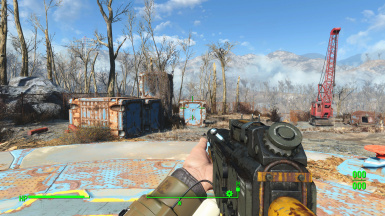 Immersive Gameplay Weapon Tweaks You only need this if you choose to install the patch! Riifle de Francotirador DKS-501 - Standalone - Traductor Esp Dese ser instalado antes del mod original. XXL DKS-501 -FRENCH- Installer le mod original. Modding is about remixing work and making it better! If you want to improve on this, go ahead, make it better! 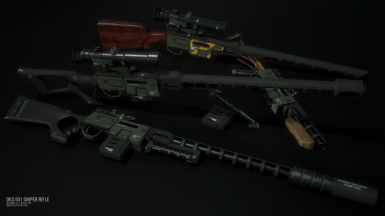 I would just like to thank DeEz, Cookie, Omolong, and allthe guys from the Facepunch forums for giving me some CK side support when I needed it, and Wasteland Melody for an excellent Chinese Assault Rifle mod and clear roadmap/template on this project. I’d also like to thank the community tool makers that continue to develop third party tools for this engine, there’s no way this would have happened with just the official toolset. ---The bolt has been moved to the right side, bringing it back to correct side of the gun. 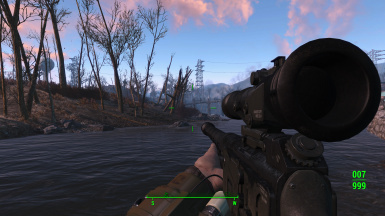 ---The size of the gun on screen has been tweaked as well, the long scope no longer takes up a quarter of the screen. It's still got a large presence, but it is no longer game breaking. ---The position of the hands in third person has been improved! Tweaks to the level lists! Snipers should show up less often, particularly on raiders. Given the way the game stores user injected data, the changes are only guaranteed to be reflected in new games. Old saves may still have a higher spawnrate. Higher rez main texture! The main body and scope texture has been rebaked and remastered at 4k resolution, making it much more crisp and detailed. Only available for the default material. Spawn lists for the legendary rifles have been tweaked in order to make their appearance more predictable - the guns should mirror their counterparts from the old games. Custom reload animations by Haru! The animations mesh with the default combat rifle set, so there are still positioning issues at this time. That said, the animations provided are great! Custom sounds by Partisan Executioner! His reload sounds bring the gun up a notch, and his firing sounds are a remixed and beefed up effect from the previous games. It really makes the gun pop! 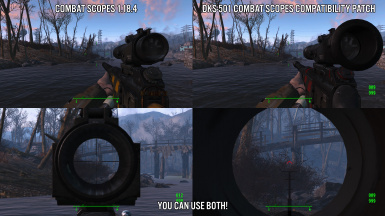 Compatibility for combat scopes! 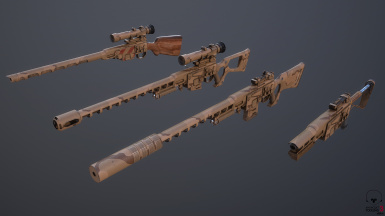 2x, 4x, and 8x scopes and recon scopes are now available using the framework. Optional .esp. Compatibility for holstered weapons! 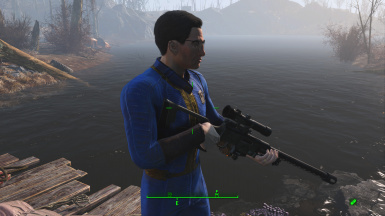 If you have the mod installed, it'll automatically equip the default configuration for the sniper rifle. Optional .esp. I'm including multiple variant meshes from various authors, so you can swap them out and pick the one you like the best if you so desire. 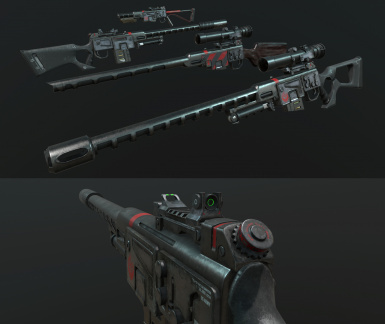 Tweak to Gobi materials - the wood stock is now a light wood, it clashes less with the desert camo. New legendary material: Circle of Steel paint scheme! The material buffs damage like a receiver mod and has an embedded 'Instigating' effect. It can be found in the forecastle of the Pridwen. New Legendaries! 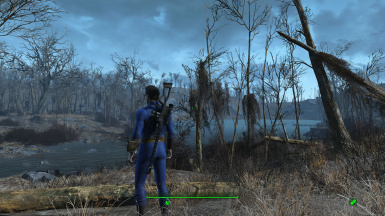 The Reservist's Rifle and Vicory Rifle make an appearance in the Commonwealth. They have similar characteristics to their older counterparts. See the discovery section for locations. Fixed the muzzleflash issue, the gun now flashes from the muzzle. Fixed the missing sounds with .38 cal and higher end stocks. All stocks now have full sound effects for every caliber. Thank you DMagnus for hammering out both of these bugs! Adjusted reload speed to something more realistic. Fixed pistol projectile from suppressor. Thanks, DarkSeraphym! See changelist tab for previous version changes! 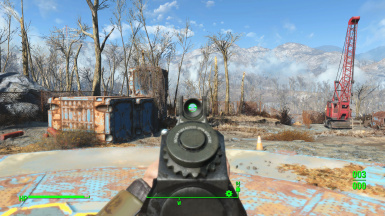 --Reflex Sight, Dot – When you’renot a fan of scopes but you want to hit your target. 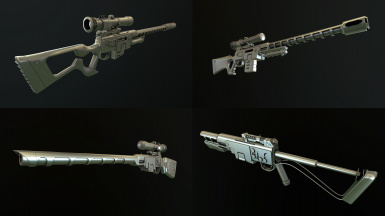 --Choose between .38, .308, and .50 semiauto, as well as armor piercing (AP) versions. ---Armor piercing receivers use the Fallout 1&2 ‘warning stripe’ receiver block. 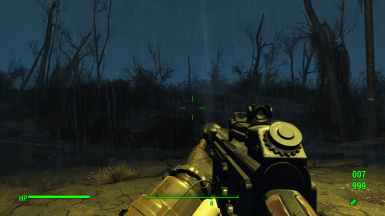 With the right perks, a .50 AP receiver is a serious threat to power armor. ---Receivers have minor variations in ammo count and firing speed to make them at least competitive with each other depending on available ammo and playstyle. --Sawed-Off Barrel – Makeshift barrel that helps to convert the gun into a short range hipfire blunderbuss. Not compatible with muzzles. --Snub Barrel - All the benefits of a 6 inch barrel on a sniper, complete with threading and muzzle compatibility. --Scout Barrel – Shorter and lighter than the standard barrel, it’ll reduce weight but at the cost of range. As seen in New Vegas. --Long Barrel – The standard barrel for Fallout 3 and New Vegas. --Long Ported Barrel – A heavier, longer range, and more accurate barrel that recreates the look of the Fallout 1&2 rifle. --Makeshift Stock – For when you want to yell ‘yeah I can jury rig anything’. It has similar properties to a short stock. --Wood Stock - The classic wood stock from Fallout 1 &2, it’s the weapon’s ‘standard’ stock. 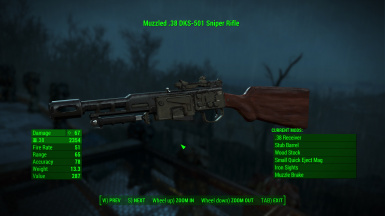 --Marksman’s Stock – The Default stock from Fallout 3 onward, it is a standard marksman’s stock. --Recoil Compensating Stock – The unique maintenance kit stock from New Vegas, it takes the role of the high level stock. Does not fight against weapon degradation as that is no longer a thing. --Bayonet – The one holdover from the combat rifle, I thought it worked well enough to include. 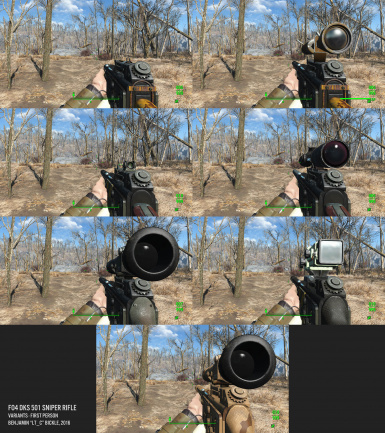 --Compensator – The Fallout 1&2 heavy barrel tip. 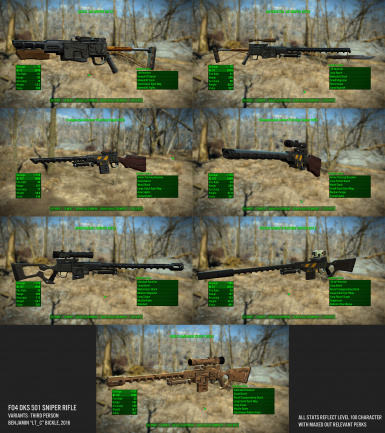 --Muzzle Brake – The Fallout 3/NV massive barrel tip. 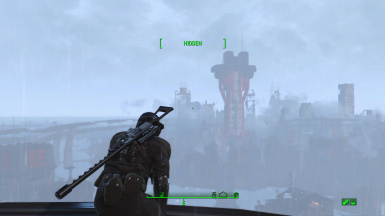 --Suppressor – A return from New Vegas and a staple of FO4. --Choose between standard and Ballistic Fiber frames. If obtained, you can also use the Gobi Desert and COS paint schemes. 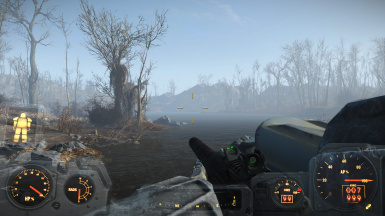 The mod will add the gun to vendors’ leveled lists, as well as in the lists of the Raiders and Gunners, starting to show up around level 25. 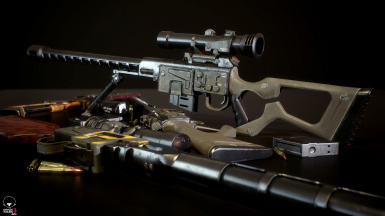 The quality of the guns found should scale up between levels 25 and 60, with Ballistic Weave coming in on epic drops at level 75. You can also get legendary varinats from defeated high level legendary enemies, although rare. 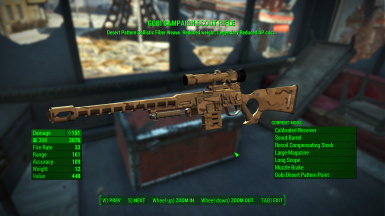 The Gobi Campaign Scout Rifle can be found in a master locked steamer trunk in a small house outside of Natick Banks. 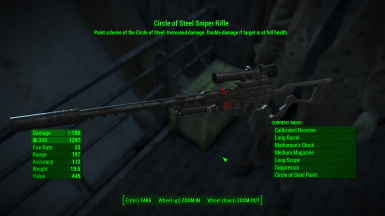 The Circle of Steel Sniper Rifle can be found in a crate in the Prydwyn Forecastle. 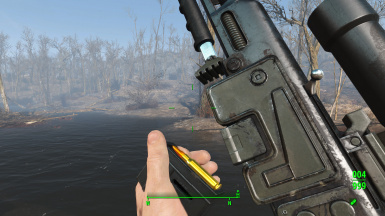 The Victory Rifle can be found in the Vertibird Wreckage in the Glowing Sea. The configuration of this rifle depends on your level. The Reservist's Rifle can be found in a duffle bag in Lynn Pier Parking. 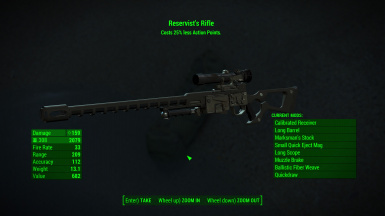 There is one more legendary rifle in the game, it can be found around Nahant. Pack plenty of .38 ammo. German Translation - Thanks, CaptainCrackhorse! AWKCR Patch - Thanks, Valwereth! New Calibers - Thanks, BrowncoatGarrus! Visual Reload - Thanks, a_blind_man! RGBO Patch - Thanks, rdmartin20! You can’t craft the Gobi/COS materials – this actually isn’t a bug since it has legendary properties, thus making it a unique ‘legendary mod’. It can be transferred between guns, like the sacrificial blade for the machete. 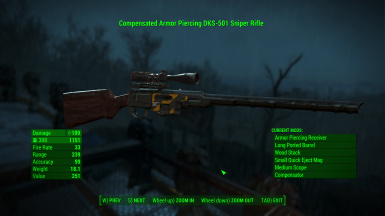 When spawning the Unique guns from console, they aren’t legendary/don’t have the legendary mod – this is due to how the game generates legendaries via script. This will force the legendary weapon spawner to respawn the guns in their containers. This is only an issue with old saves, it'll be fine on a new game. The custom sounds don't cooperate with silencers. They are still silenced from a gameplay standpoint, they just don't fire the correct sound. Attempts to fix have broken the mod and my faith in creation engine. Fix the above bugs, if possible.